The big highlight of August is, of course, the Perseid meteor shower. With a high number of meteors per hour and a broad peak, it is one of the best of the year. The peak should fall on the night of August 12-13. Unfortunately, the Moon will be full on the 10th, so this won’t be the best year for Perseid watching. However, there are a few other meteor showers at this time of year. If you go out in the early morning hours the week before, say around August 3-5, you should catch a few Perseids in the Moonless skies, as well as a few Delta Aquariids, which peaked on July 28, or some Alpha Capricornids, which peaked on July 29. Looking east on August 5 at 2 AM. 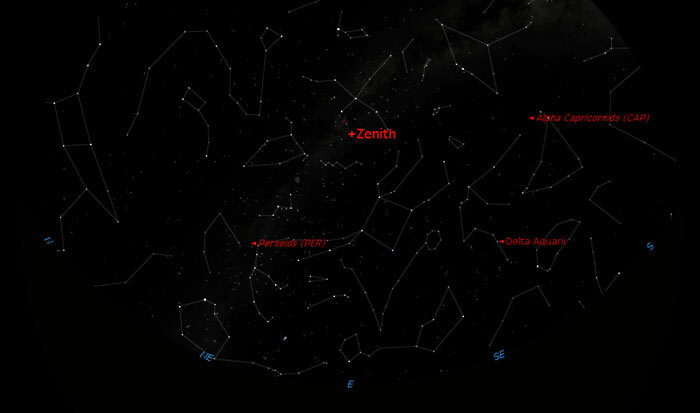 The radiants of the three meteor showers are marked. Speaking of the Full Moon, this month’s full moon is the closest one this year, an occurrence the media have dubbed a “super moon” in recent years. If you can’t really tell that it’s any different from a normal moon, you’re not alone. In fact, the moon illusion from July was probably a bigger effect. With the full Moon on the 10th, the first week is the best for Moon watching, and the last half of the month will be the best time for evening deep sky observers. Mercury reaches superior conjunction on the 8. Look for it in the evening skies soon after sunset beginning around August 20 if you have a clear western horizon and a pair of binoculars. A young crescent Moon makes it a little easier to find on August 27. However, it’ll be an easier catch in September. This is a great month for Venus, even if you’re not big on observing in the morning. It’s the last thing visible in the pre-dawn sky. As it slowly approaches the Sun, it also meets up with Jupiter. 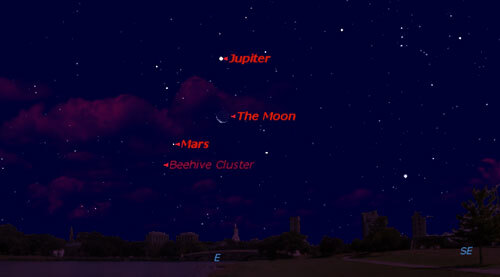 Look with binoculars around 5:45 – 6 AM on August 17 – 19 as the two planets converge on the Beehive cluster (M44) in Cancer. On the morning of the 18th, the two planets will only be about a quarter of a degree apart, or about the same separation as Alcor and Mizar! In fact, they’ll be so close, Starry Night can’t show the labels for all 3 objects, so the map is for the night before. 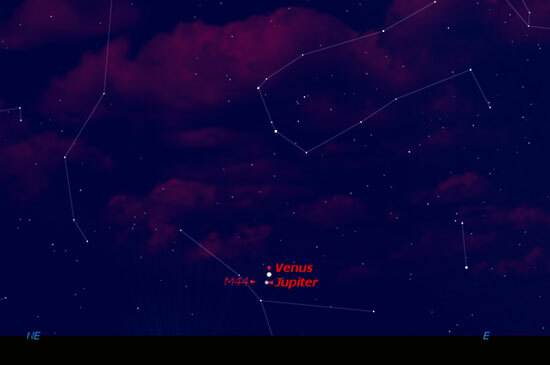 Venus and Jupiter in the Beehive cluster on August 17 at 5:45 AM (about half hour before dawn). Mars still graces the evening skies, but much farther away now than earlier this year. It makes a nice contrast with nearby yellow Saturn. The first quarter Moon passes about 2 1/2 degrees from it between the 2nd and 3rd. 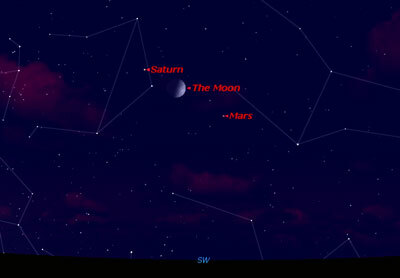 The three objects line up nicely in the southwest at 10 PM on the 3rd. Looking southwest on August 3rd at 10 PM. Jupiter is up in the mornings now, quickly pulling away from the Sun. Don’t miss that conjunction with Venus and the Beehive on the 18. Saturn is probably the best evening planet this month. Look for it near Mars in the southwest at 10 PM. 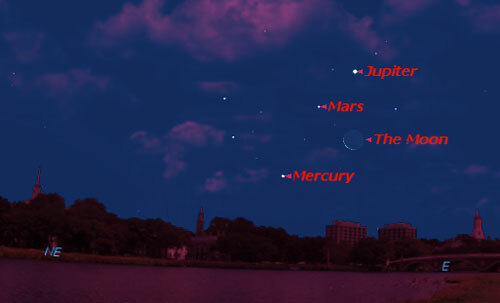 For those with a telescope, your best Neptune views are coming up. It’s at opposition on August 29. Of course, that means your best chance of seeing this will be in September and October. 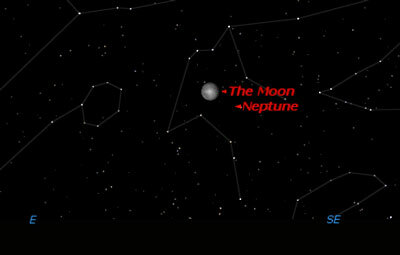 On August 11, the Moon is only about 4º away from Neptune, so you might be able to use it as a guide. 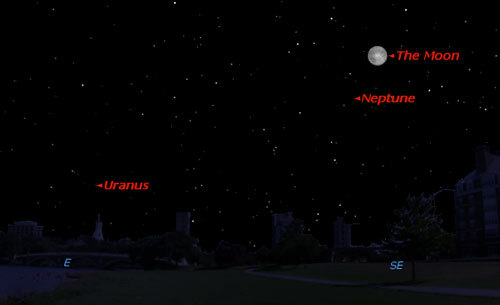 The Moon close to Neptune not long after it rises in the east-south-east at 11 PM on August 11. August is a great time for deep sky observers. The Sun sets a little earlier now, but the nights aren’t too cold yet, so it’s a good time to pull out that telescope. Some of the nicest open clusters are high in the south around 10 PM. 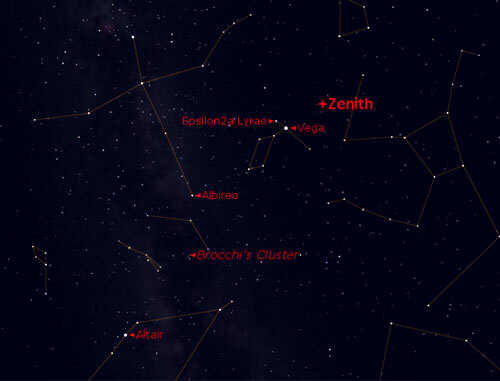 If you have a low horizon, now is the time to look for M6 (the Butterfly cluster) and M7 (Ptolemy’s cluster). A little easier to spot is M11, the Wild Duck cluster. The coat hanger cluster is a good one for binoculars. To find it, start form Vega and follow a line straight to Altair. 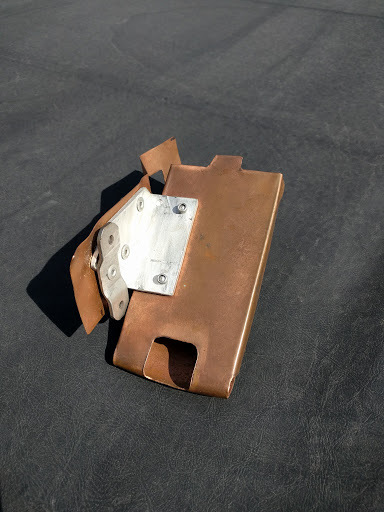 About 2/3 of the way there, you’ll spot this cluster that looks just like an upside down hanger. Fans of globular clusters have three of the nicest clusters in the evening skies: M13 (the great cluster in Hercules), M92, and M3. Two of the best and brightest planetary nebulae are high in the evening skies too: M57 (the ring) and M27 (the dumbbell). 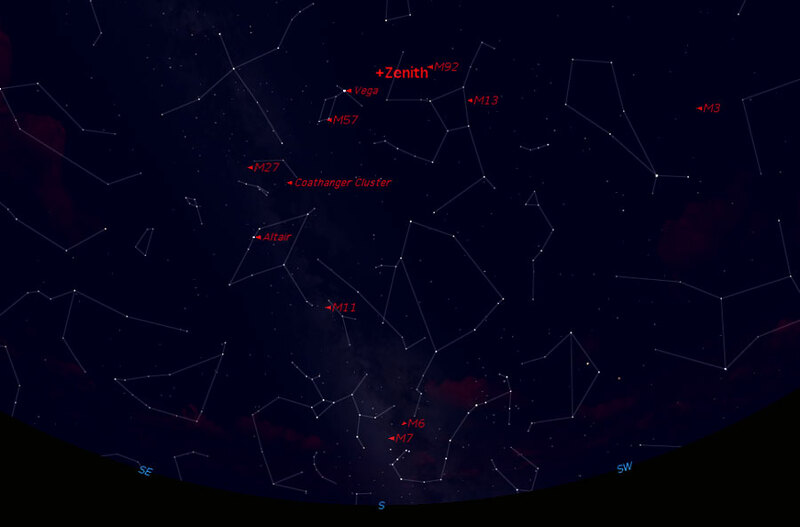 Looking south on August 15 at 10 PM local time. Deep sky objects are labeled. Click for a larger version. With all the media hype surrounding the “supermoon”, I’m sure many people will be out looking at the moon. So this month, I thought I’d highlight a few things you can see naked eye. The first thing you’re likely to notice when you look at the Moon is that there are bright and dark patches. In general, the dark areas are Mare (pronounced with 2 syllables, like mar-ay) and light areas are the highlands. A few thousand years ago, people thought the dark area were actually seas, and the word mare means sea in Latin. The Maria are fairly smooth plains of basalt formed when a meteor punched though the thin crust of the young Moon and allowed the iron-rich magma to well up to the surface. The very round shape of Mare Crisium (Sea of Crisis) and Humorum (Sea of Moisture) reflect their origins as giant impact craters. 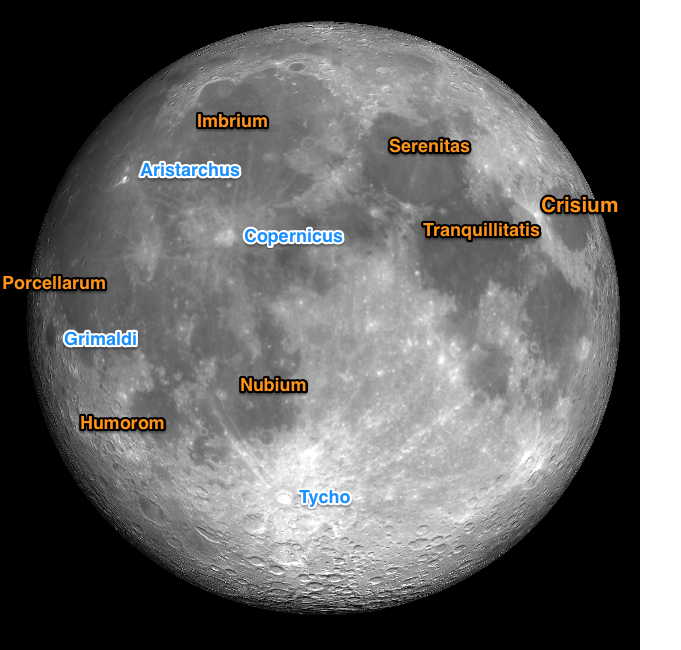 Mare Tranquillitatis (Tranquility) is famous for being the Apollo 11 landing site. Apollo 16 and 17 also landed near it, 16 to the south and 17 to the north. Apollo 15 landed in the highlands between Mare Serenitas (Serenity) and Mare Imbrium (Showers). Apollos 12 and 14 landed along the north of Mare Nubium (Clouds). Mare Porcellarum (Storms) is on the western edge, and best viewed when the Moon is in a waning phase. Not all of the dark patches are big enough to be Maria. Cater Grimaldi is a small dark spot just below Mare Porcellarum, barely visible to the naked eye. Younger craters tend to be bright, and the easiest to spot are surrounded by bright rays. Crater Tycho’s rays spread across nearly a third of the Moon’s face. Crater Copernicus’ rays are very easy to spot where they cross Mare Imbrium. Crater Aristarchus makes a bright spot between Mare Imbrium and Mare Porcellarum, though it’s small size makes it a bit hard to spot naked eye. The Full Moon, with some of the major maria and craters labeled. Enriching Scholarship is “a week of free workshops, discussions, and seminars… for instructional faculty and staff” at the University of Michigan. The first session of the week was From Inspiration to Implementation: Teaching and Technology Today and Tomorrow. The second half was a breakout roundtable discussion. I sat ein on a discussion of using online public resources as student projects to enable learning, lead by Lauren Atkins. Lauren discussed an example of a class that develops real websites in an archive that real people who have no background in the subject are likely to use. Although the students start the semester with no previous knowledge (like their readers), by the end of the semester they are demonstrate a deep understanding of the issues and are able to create websites that are useful to others, and that they themselves are invested in and proud of. We also discussed examples of blogging to get students involved in a topic, and communicating with each other. 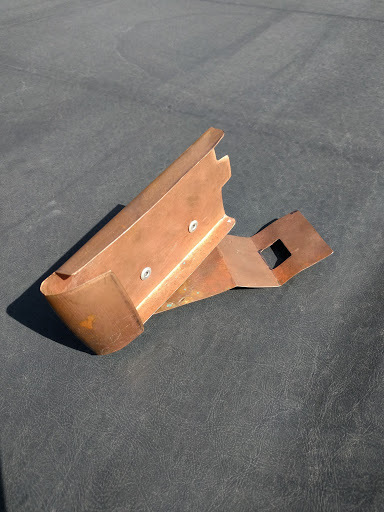 By making materials public, especially if they know they have an audience, the students have a vested interest in making them good. 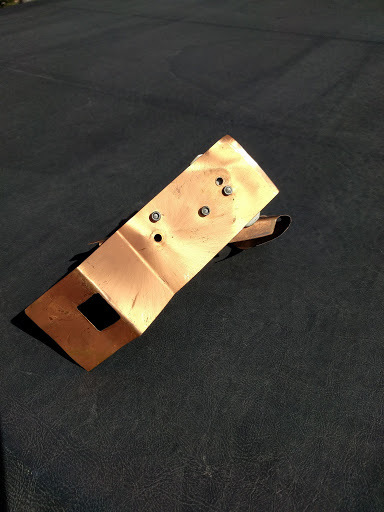 However, most class projects include a formal assessment component. So how do we grade these assignments, especially in large lecture courses? 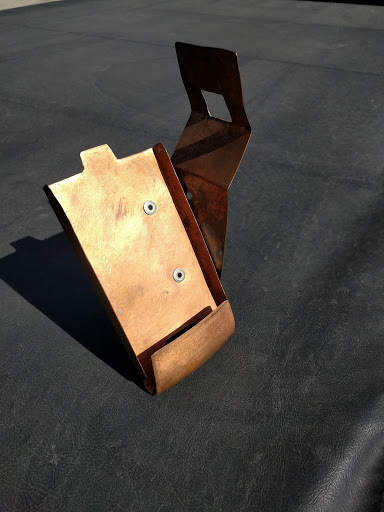 In general, the material has to be hand graded. One option is to use something like a blog or wiki for students to practice, share ideas, and test out material for a final project, but only the final project is actually graded. Another option is to use peer evaluation, similar to a MOOC. ISS has access to Coursera software, so instructors can try out some of the things like the peer evaluations. Rubrics have to be carefully crafted, which is very hard to do the first time you give an assignment. That discussion lead to another idea: ask students to develop a mini-curriculum for one section of a course, and also asking them how they would assess whether or not someone had learned the material. Rather than grading their work, use their work to develop the exam questions.